Reel Stories Starts March 10th! 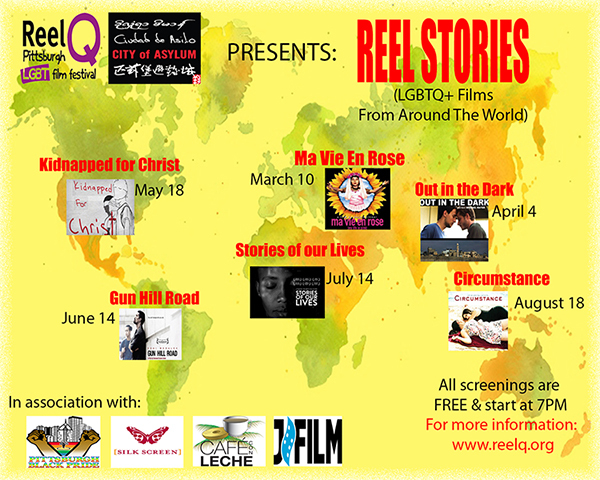 Reel Stories is an international film series created by Reel Q Film Festival as a way of introducing new audiences to LGBTQ+ films and stories from around the world. We started the series to support and expand opportunities for civic engagement on issues important to our community. The films highlight works by artists we admire, those who are gaining visibility and those fighting for equality in their countries. Reel Stories has allowed Reel Q Film Festival to work with many fantastic local non-profit organizations, such as: City of Asylum, Café Con Leche, Black Pride, JFILM, The Gay & Lesbian Community Center and Silk Screen Film Festival (to name a few) and tell the stories of artists who are changing their communities through a greater visibility into the mainstream discourse. Reel Stories starts March 10th through August 2017. All screenings have no admission fee and take place at City of Asylum’s Alphabet City (40 W. North Ave). Please check out our website at: www.reelq.org/events for more information on movie show times, guest artists and post-screening panel discussions.